Increase repetitions and decrease resistance for sleek, toned legs. Giannini recommends high-intensity interval training to her clients to burn off the top layer of fat and reveal the sculpted leg muscles underneath. 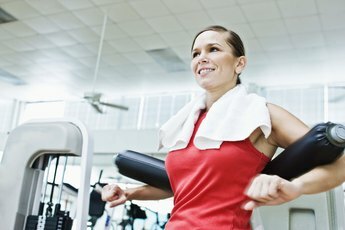 She suggests performing an intense activity -- such as box jumps -- for 20 seconds, followed by a 10-second rest, and repeating that cycle eight times with a minute of rest between sets. Repeat for a total workout of about 20 to 30 minutes. A study published in the June 2012 issue of “The Journal of Sports Medicine and Physical Fitness” found this type of training more effective at improving body composition than traditional steady-state cardio exercise among young women. Engaging in yoga tones all of your muscles through isometric contraction. Although simple yoga poses such as warrior two may not appear challenging, they are. A study published in “The Asian Journal of Sports Medicine” found that women who performed sun salutations -- a simple sequence of yoga poses -- for about five months decreased BMI and total body fat percentage. Some key poses to tone the legs include crescent pose, triangle pose, warrior one and two, and chair pose. 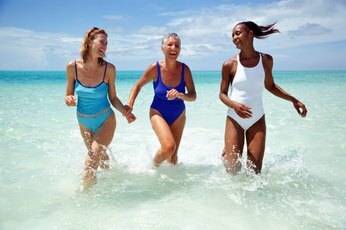 Take a cue from the svelte, female Olympic swimmers and hit the pool. Breaststroke, butterfly, backstroke and freestyle swimming work all of the muscles of your legs with high repetitions and low resistance. The different kicks performed in each stroke activate different muscle fibers in your legs, resulting in enhanced muscle definition without bulking up. Running is the ultimate high-repetition low-resistance exercise. It burns calories to reduce body fat while simultaneously toning leg muscles for a sleek appearance. Stretch before and after running to improve range of motion and to prevent injury. Uphill hiking and exercising on a stair climber torch calories, but because of their relatively high resistance, they may contribute to muscle hypertrophy. Women who tend to build muscle easily may wish to avoid these forms of exercise in favor of hiking on relatively level ground or exercising on an elliptical trainer. Asian Journal of Sports Medicine: How Effective is Sun Salutation in Improving Muscle Strength, General Body Endurance and Body Composition?